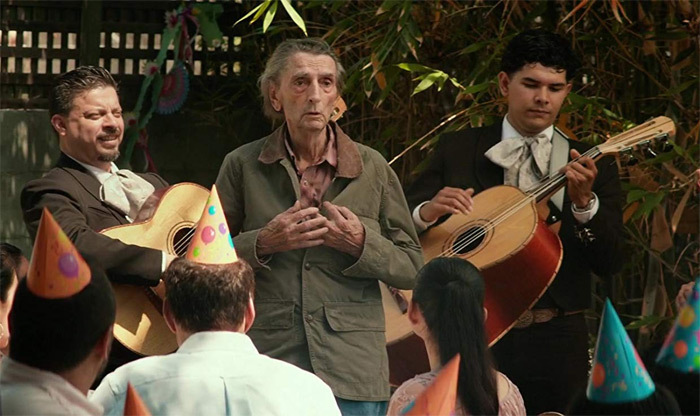 The overriding theme of this memorable film, and equally memorable acting performance by 89-year-old Harry Dean Stanton, is mortality. The loneliness of Lucky, the nickname of the character he plays, is brought into sharp focus. Philippines fighting against Japan during the Second World War. In effect Stanton is addressing his own death – he died shortly after completing the movie – and the final scene is poignant. A chain smoker of the ultimate kind, Lucky lives alone in a tiny desert town in Arizona/California near the Mexican border, which glory be has very few cars! He has daily habits of exercising inside his small ranch, watching game shows on TV, doing crossword puzzles, visiting the local diner in the daytime and frequently visiting the same bar in the evening, drinking glasses of ‘Bloody Marias’. In the bar he airs his views about life to various customers including Howard (David Lynch) – no relation to Director John Carroll Lynch – who has recently had the misfortune of his 100-year-old tortoise, called President Roosevelt, disappearing from his dwelling. Even though he is very old Lucky is still haunted by the memory of accidentally shooting a mockingbird when he was a young man. It is the biggest regret of his life. He is also haunted by other demons from his past, particularly so when he frequently has disturbed spells of sleep. The film is quirky throughout but is rich with meaningful comments on the concepts of life and death and light and dark.